The Orchard01263 715779work01603 870304fax Self-cateringThe Orchard, on one level attached to the property of the owner and with views over the duck pond, is situated in the coastal village of East Runton. The sandy beach is close by with walks to Cromer or West Runton, and the village has a few shops, pubs and a restaurant. It is a peaceful location from which to explore the coast and countryside of North Norfolk. Exterior of property and garden. The Orchard, on one level attached to the property of the owner and with views over the duck pond, is situated in the coastal village of East Runton. The sandy beach is close by with walks to Cromer or West Runton, and the village has a few shops, pubs and a restaurant. 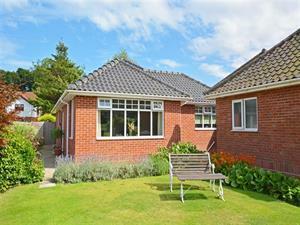 It is a peaceful location from which to explore the coast and countryside of North Norfolk.